Be beautiful and support PATH International at the same time. From now until September 10, AVON representative Julie Gridley will donate 7% of all AVON orders to PATH Intl. Orders must be placed through Julie at www.youravon.com/byJules. You must use the code DONATETHERAPY for PATH Intl. to receive the donation. Click here for details. You can now support PATH Intl. on eBay! Donate 10 to 100 percent of any item up for sale and choose PATH Intl. as your cause. Click here for more information. You can see in the 2011 PATH International Conference and Annual Meeting registration book the great session line-up and can also decide which networking events you would like to attend. You'll see that the session line-up is divided into levels, designated by horseshoes. One of the many wonderful things about the PATH International Conference is that there is something for everyone, from the newbie to the advanced member. For example, "The Bricks & Mortar of Community Building" is at the novice level, designated by a single horseshoe. In this session, you will find out how to create healthier, more effective communities. The group will engage in experiential exercises as it identifies aspects of community building. Another session, "Diversifying Your Programs for Sustainability," is at the Expert level, shown with three horseshoes. In this "advanced knowledge" session, four EFL models are examined to provide a formula for creating innovative programs. Whether you are new to the EAAT industry or have many years behind you, you will find something of interest in the Research, Program, Administrative and EFP/EFL tracks. Book a room at the Hyatt Regency Lexington by calling (859) 253-1234 or click here. Enter the code g-NARH into the corporate\group# field to apply our group rate. If you call for reservations, be sure to mention you're with PATH International. Session details can be found in the registration book. A copy of the registration book was mailed with the summer edition of PATH Intl. STRIDES magazine but you can also click here for the digital registration book. Airline Discounts for Conference Registrants! All conference registrants must register separately with a unique personal email address. If you are registering more than one person, please note that you will need to process each individual separately using his or her unique email address and password. This will ensure that all registrants will be properly credited with their continuing education hours under their individual account records. 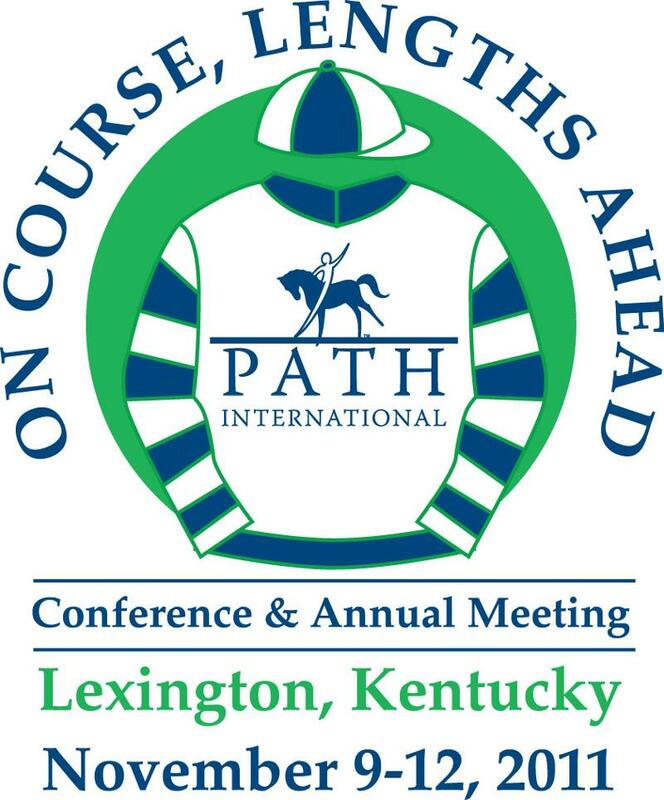 If you are registering multiple people and do not have their personal sign-in information, we recommend sending in hard copies of the registration form to the PATH International office. Copies of the registration from can be found in the summer edition of PATH International Strides. You can also click here to visit the conference page and download the registration book. If you are having difficulty logging in with your email address and password, please contact the PATH Intl. member services department for assistance, (800) 369-7433. While this certification opens the door for many additional programs and services to be provided in the field of equine-assisted activities and therapies, there are enhancements needed. There are multiple PATH International committees and task forces working on refining the certification as well as the standards and guidelines that are affected. Watch for future updates in the PATH Intl. eNews and other communications coming soon. You are heading out to catch your horse. Your thoughts are most likely filled with what awaits you once you get in the saddle. Maybe it is a nice stroll in the woods or a schooling session. Maybe it is a lesson that you have planned or moving the cows from one pasture to the next. Whatever your endeavor might be, rest assured that your equine friend probably won't be thinking the same thing. Because horses live in the moment, their minds will most likely be quiet. They may just be enjoying the morning sun, snoozing in their shelter or grazing in the pasture peacefully alongside their friends. While we have grand ideas about what lies ahead, our equine partner most likely will not. One of the most valuable gifts our horses give to us is the idea of living in the moment. To help us understand our horses better we need to clear our minds of all thoughts about the past or the future. We want to focus on being in the present and approaching him in a mindful manner. Take a few big, deep breaths before you head out to get your horse. Allow the breath to travel through your body. Upon exhaling, release all tension and let your mind become calm. When you see your horse, take a second to connect with him. Think about what he may be feeling. Become aware of all that surrounds him. Observe his body language for a minute. Get a sense of how he is responding to your approach, to the other horses and to the environment around him. When you do approach him, do it mindfully. Say "hello" instead of just going up and putting on his halter. Give him a rub on the withers and down his back. Scratch his sweet spot. Allow him the pleasure of your touch and being in your presence. Then "ask" him for permission to put on the halter. Wait for him to turn his head and show that he is ready. Breathing, connecting with the moment and approaching your horse mindfully will help to ensure a more pleasant experience for you both. Likewise, practicing this during the time that you are away from your horse is also of great benefit. Remembering to breathe and relax during busy or stressful times throughout your day will help you tremendously. Taking a few deep breaths will help you relax mentally, physically and emotionally. It will also greatly improve your overall awareness of the world around you. Regardless of where you are or what you are doing, your breath is your most powerful tool. Remember to use it. So just breathe, relax and enjoy living in the moment, just like your equine friend! Looking to Adopt Horses for Your Center? Start Here! Many times we at PATH Intl. are asked by centers where they can find horses. PATH Intl. is partners with DonateMyHorse.com, a place where prospective horse donors can post their horses for adoption and where prospective adopters can see available horses. In addition, two other programs offer horse adoption services. The Standardbred Retirement Foundation in New Jersey, www.adoptahorse.org, follows horses for life and generally does a fairly extensive training of their horses. They will also place horses in therapeutic progrms at no cost. New Vocations in Ohio, www.horseadoption.com, also trains their horses. They deal with many horses, so if they don't have the right horse today, they may in a short while. If you are looking for horses to adopt into your program, start with one of these programs.